Tech Armor is the #1 trusted online resource for screen protection with the industry leading NO-HASSLE LIFETIME WARRANTY. Preserve your resale value- Protect your Kindle HD 7" Tablet screen from scratches, dust and daily wear and tear while removing glare and resisting fingerprints. Tech Armor TruTouch Flawless Touchscreen Accuracy. Anti-fingerprint "Oleophobic" Coating magically resists oils and reduces annoying fingerprints. DID YOU KNOW - A screen full of scratches will lower your resale value! 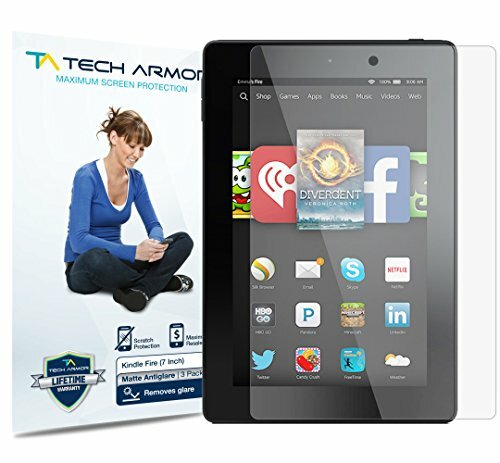 PRESERVE YOUR INVESTMENT AND MAXIMIZE RESALE VALUE - The Tech Armor Matte AntiGlare screen protector not only reduces glare and resists fingerprints, but also protects your screen from scratches that reduce the resale value of your Kindle HD 7" Tablet! No detail has been overlooked with this "Best-In-Class" product from Tech Armor - industry leader in screen protection. The Tech Armor Antiglare screen protector combines scratch protection with a unique matte finish dramatically improving visibility in bright sunlight or office lights. Use your device wherever you are, whenever you want!